In this betting tutorial we dispel some of the myths surrounding reading horse form and point you in the direction of some profitable, time saving angles when assessing races from a laying perspective, using the Racingpost.com. 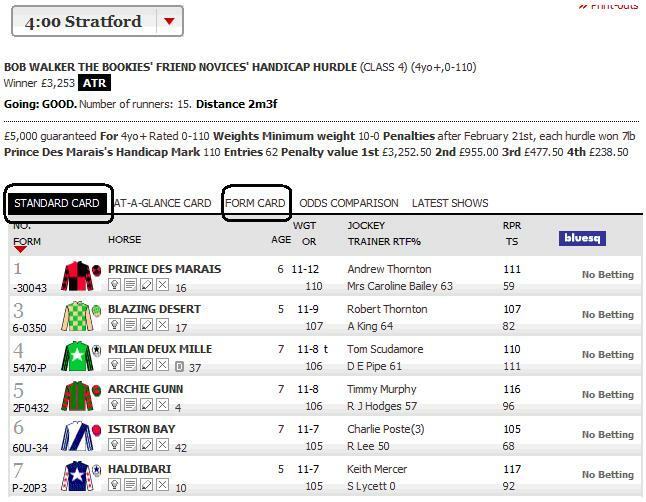 Please bear in mind some of the features shown are only available to full members of the Racingpost site. However, basic membership is only £0.25 pence a day, about £7.50 a month. Considering the paper version is around £2 per copy, an online membership in comparison is much cheaper and you can access the site 24/7. The following steps should make your race assessment quicker and more objective. When you get to a race click on STANDARD CARD or FORM CARD. 1ST and 3rd along the top just below the race details. Briefly read every runners spotlight, and last 6 races, don’t over analyze anything at that stage. The more you do it the quicker it becomes. 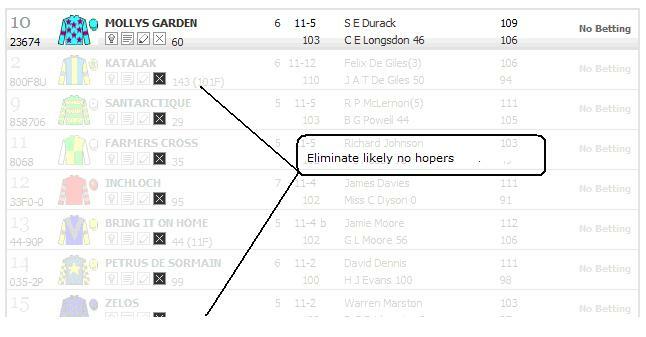 Eliminate those horses that don’t look in with a real chance (Usually those outside the first 5 in the betting forecast) but not always. In many cases the rest are just making the numbers up. To eliminate those runners – CLICK the “X” below each horse’s name, it’s the 4th tab along; this “whites out” those runners from view. Now you are left with maybe 2 to 5 horses to assess, depending on field size. This elimination process makes the screen clearer and easier to focus on. 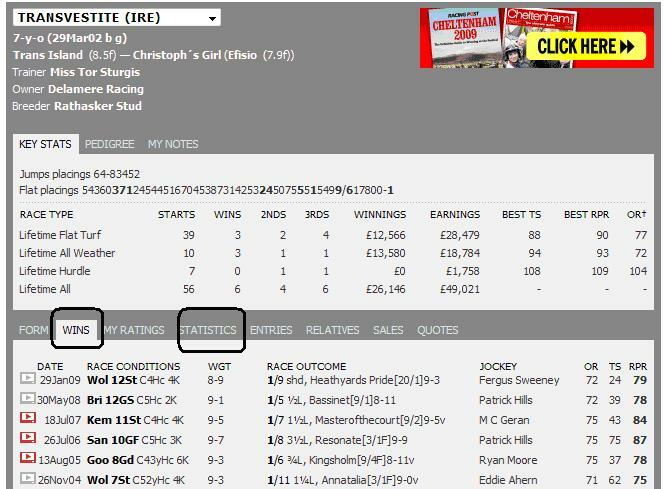 To see if a horse is proven in the race conditions click on the horses ACTUAL NAME – this bring up more than last 6 races. 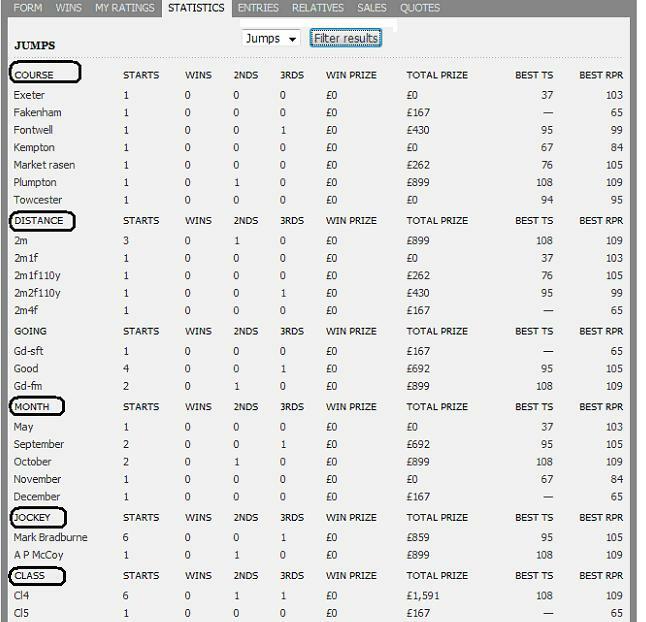 In the horses history you will see a series of tabs, there are 8 in all – Clicking on the WINS tab will tell you exactly what conditions the horse has won under compared to today’s race – CLICKING on the “STATISTICS tab” tells you exactly what class, distance going, etc the horse prefers in a very defined easy to read order. In this case I fancied laying TRANSVESTITE, no pun intended. I’m happily married lol! 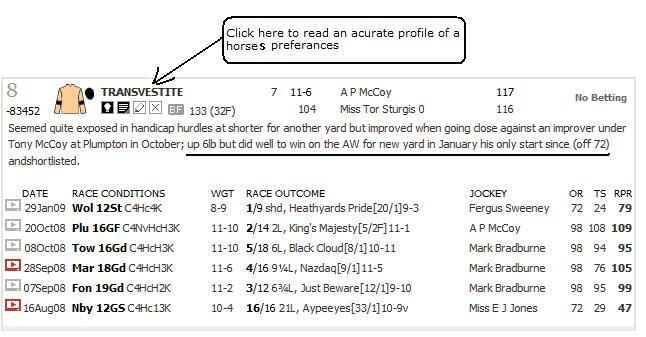 Click on the wins and statistics tabs to berifly assess each horse race preferences. Remember you will only need to follow the above steps for the runners that have not been “eliminated”. Once you’re familiar with everything it takes a lot less time to assess a race. This ELLIMINATION process is the key to focus and time saving. Be TARGETED – get rid of the no hoper’s straight away, leaving only likely contenders to focus on. At this stage maybe you are thinking why don’t I just use the POSTADAT TABLE to find out all this info? 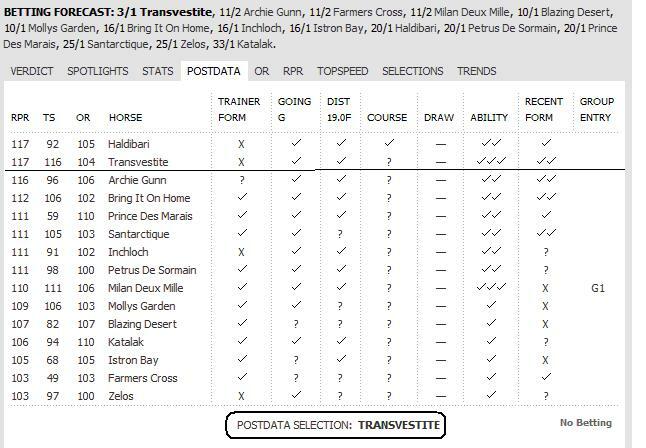 The Postadata table is a quick reference tool which can assist us in our race assessment, BUT it is not as informative as it first may appear there are just too many grey areas in my opinion. How many times a week does the horse with highest POSTADATA table score get beaten? I’m not suggesting for a moment that you simply lay horses with the highest Postadata score, but trying to point out that many are not “entirely” suited to the prevailing race conditions. TRANSVESTITE is a good example of this theory in action. TRANSVESTITE has 3 ticks for ability, but as far as I can see most of that is based on flat form. In fact its last win was on the A.W. at 12f – the current race is 2m 3f handicap hurdle. Although it does have some jumps experience, as far as I’m concerned this animal is a false-favourite. Transvestite eventually lost the race providing me with a profitable lay. Assessment of this race took no more than 15 minutes. 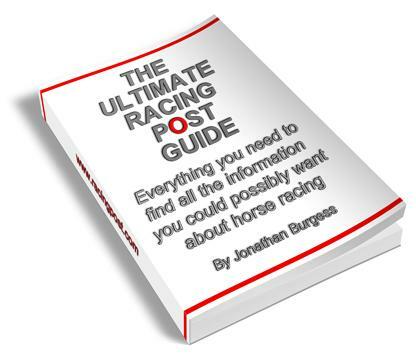 Get the very latest Pro Tips and short cuts on how-to really use all the racingpost website. Become a FREE member and Download our EXCLUSIVE FREE 52 page guide NOW!